While pregnant with her first child, Rebecca McClary had an emergency C-section at just 27 weeks. Her baby girl, Savannah, weighed only 1 lb., 2 oz. Because Savannah had several health problems related to her prematurity – including pulmonary hypertension caused by her underdeveloped lungs – she spent her first 109 days in a neonatal intensive care unit. “When she finally went home, she still needed to be on oxygen and a feeding tube, but things went well for the next 2½ months,” Rebecca said. However, when Savannah aspirated fluid into her lungs, Rebecca and her husband, Robert, brought her to Akron Children’s Hospital, where she was admitted to the pediatric intensive care unit. Her parents, who live in Canton, never anticipated this would turn into a 4-month hospital stay or that she would need so many procedures, including a tracheotomy to help her breathe. During this time, the McClarys met the palliative care team, including nurse practitioner Marlene Hardy-Gomez and social worker Denise Powers-Fabian. Since Rebecca had quit her job during her pregnancy, Powers-Fabian helped connect the McClarys with financial assistance and resources for medically fragile children like Savannah. Palliative care was also there to answer questions and support Rebecca and Robert through their daughter’s long stay in the PICU. Although she’s now home, she still has a tracheotomy and requires tube feeding and overnight nursing care. 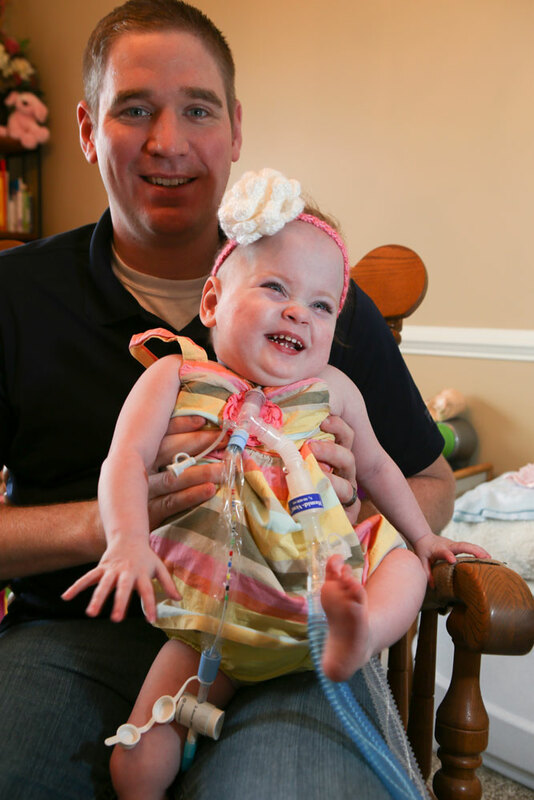 At 18 months old, Savannah has been through a lot in her young life. Because she’s so susceptible to respiratory infections, something as simple as a common cold could result in another hospital stay. “Our goal is to keep her out of the hospital as much as possible,” said Rebecca, who limits Savannah’s contact with others, especially those who might be sick. To help the McClarys manage Savannah’s care at home, Akron Children’s palliative care team created a flow chart of steps they should take in certain situations, including when to take her to the hospital. They also created a card with Savannah’s medical information that the McClarys could give to paramedics in the event of an emergency. Although she continues to grow and get stronger, Savannah still has many health problems common in premature babies. In addition to pulmonary hypertension, Savannah has bronchopulmonary dysplasia (BPD or chronic lung disease), difficulty swallowing and an atrial septal defect, commonly known as a hole in the heart. “The hole in her heart is closing on its own, so fortunately she won’t need surgery to repair it,” Rebecca said. To manage these conditions, Savannah is under the care of a team of Akron Children’s specialists from pulmonary medicine, cardiology, gastroenterology, surgery, infectious disease and ophthalmology. “Palliative care brought the entire team together to coordinate Savannah’s care and have helped with scheduling all her medical appointments,” Rebecca said. Along with the support they’ve received from the palliative care team, the McClarys are blessed with a large support system that includes their parents, siblings, friends and fellow church members, and Robert’s co-workers at First Energy. Although Savannah still faces challenges, she’s doing well, thanks to the care and support she’s received from Akron Children’s and loved ones and friends who surround her at home.